Background In ancient Greek mythology there was a sea god named Proteus. His most notable characteristic was that he could change his shape at will, from a man to a fish, a whale, a bird, or anything else. This most useful skill against opponents gave rise to the expression of being in a "Protean struggle." The Proteus game set is so named because the game can change its form  not its physical form, but rather the game rules themselves. Object: Attain the Goal in effect at the end of the turn. Equipment: The Proteus board; 3 pieces per player; 9 engraved tiles. Proteus pieces move like certain chess figures, with these exceptions:  a piece, except when moving as a king, may leap over another piece if there is an empty space on the other side of the piece being jumped over; there is no capturing. 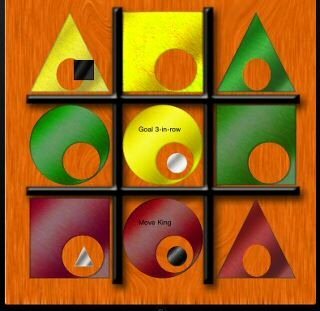 Active MOVE rules apply equally to all pieces. Only one piece allowed per space. KING  moves like a chess king, one space in any direction. ROOK  moves like a chess rook, any distance in the same row or column (horizontal or vertical). BISHOP/KNIGHT  moves to any empty space not in the same row or column. POLARITY  both tiles to be traded must contain pieces, and the pieces must belong to opposing players. The symbols on the pieces don't matter. COLOR  both tiles to be traded must be the same color. The color doesn't matter, and they need not be occupied. SHAPE  both tiles to be traded must be the same shape. The shape doesn't matter, and they need not be occupied. These tiles represent the three different ways a game can be won. The first method is just like Tic-Tac-Toe. The other two methods require that a player's 3 pieces occupy similar tiles, regardless of their relative positions on the board. 3-IN-LINE  The winning player's three pieces must be in a straight line, horizontally, vertically, or diagonally. COLOR  the player's three pieces must occupy tiles of a single color; symbols on pieces need not match the tiles. SHAPE  the player's three pieces must occupy tiles of the same shape. The board begins empty, with the 9 tiles spread around for easy selection in a common pool. Black places first. Players take turns placing any of the tiles from the pool face-down onto any empty space of the board, or placing one of their own pieces onto any space already occupied by a vacant tile (never onto an empty space). Once placed, no piece or tile can be moved during this phase of the game. When a piece and a tile of the same shape come together, that tile is turned face-up and becomes active. Its rule will stay in effect until another tile of the same color is activated. During the 15 turns of the placement phase, one and only one tile of each color must be activated. They may be activated in any order and by either player. Once a tile is activated, no other tile of the same color can accept a piece of matching shape until after all tiles and pieces have been placed. Plan ahead: it may happen that only one player can activate a tile and therefore must do so. For example, if two of the three tiles of a color are already occupied by non-matching pieces, only the third tile is still open for activation. If only one player has a piece of the requisite shape to activate that tile, that is a mandatory placement for that player. 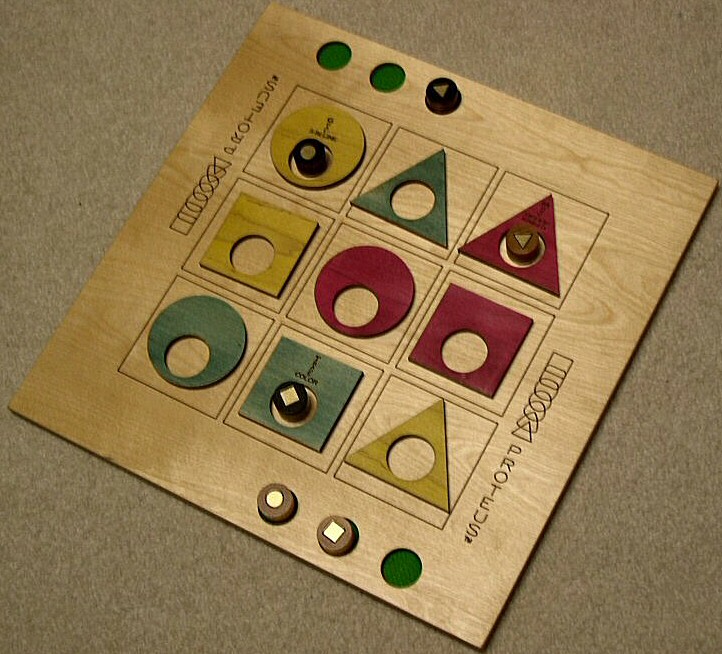 The movement phase begins when all the pieces and tiles are on the board and three tiles of different colors are active (provided the game was not already won during the placement phase). Players take turns moving any one of their own pieces to a vacant tile (according to the active Move rule), or exchanging two tiles (according to the active Trade rule). When, through a move or trade, a piece and tile of the same shape are brought together, that tile becomes activated. It is turned face-up, and the previously active tile of the same color is turned face-down. The new rule is now in effect for both players. If a trade of two inactive tiles of the same color produces two matches, they cancel each other and the previously active tile stays in effect. The first player to satisfy the Goal active at the end of that turn is the winner. If both players simultaneously meet the goal, neither wins and the game continues until there is a clear winner. Proteus is a game lover's game, and we've often had comments that it's hard to find good partners to play Proteus. We're offering a partner matching service: If you own a Proteus set and would like to find others to play it with you, either by email or postal, send us your name and email address, and we will compile a databank to be shared only by its members. Email to: Proteus Play.